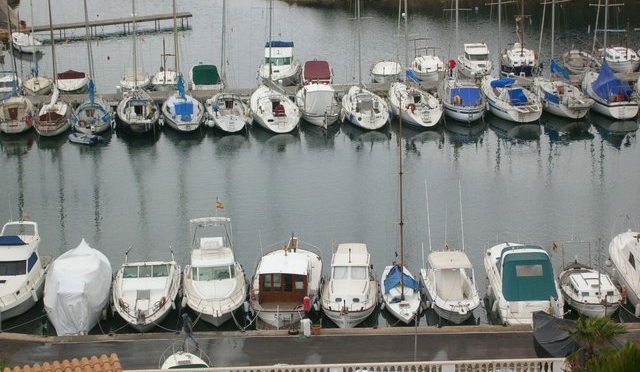 Menorca has been adding pontoons, buoys and ramps for many years to facilitate maritime activity. There is a constant increase without any analysis to see if the coast is already overwhelmed. Recently, the General Plan of the Balearic Ports has been made available to the public. GOB has filed some questions with reference to Menorca. It is considered that the draft Plan incorporates interesting philosophies for answering nautical requirements imaginatively so as not to depend always on moorings in strips of water, such as slipways for launching boats, or the parking of boats on land and other ways. It is important to try to respond to the demand for moorings with solutions that have the least impact on the environment. But a deficiency was found that is key to the Plan and it is necessary to deal with this before following the endless increase in the demand for moorings. For this reason a request has been made that the Plan of the Ports incorporates an analysis on the Islands’ capacity for maritime moorings and on the saturation level that can be reached in some places. In the same way that it is understood how inadvisable it is to increase car parking at beaches without any limitation, but to adjust it according to the capacity of each beach, so also there should be incorporated into the Plan the nautical capacity of each island and the pressure caused by the currently registered demand. This is feasible from analysing nautical visits made to every cove and beach, with a basic arrangement that discounts areas dedicated to swimmers and areas with marine habitats of interest (unless they have buoys marking the areas where anchoring must be avoided) and so defining the capacity for boats in each place. The sum of the results from different places will give the possible nautical presence. It must also be borne in mind that excessive nautical pressure on a particular area ends in down grading its attractiveness. This can be caused by affecting the seabed, by contamination of the waters or by the feeling of overcrowding felt by those who enjoy the coast. On the other hand, activities are found in the Plan that increase human pressure on an area that a few years ago had already experienced expansion of this type such as the growth of the marina at Addaia. Here the area of water used has doubled for the purpose. It has to be remembered that not long ago a reorganization and a substantial increase in the number of moorings were made in the area adjacent to Cala Molí. The confirmation of an attempt to renew the offer some years after shows the necessity of first defining the capacity for moorings and not to act without a limit. In the arguments put forward, potential dangers were expressed of slipways which are often at points where repairs and maintenance of boats are carried out. In this respect it should be remembered that this type of activity (scraping down, painting, changes of oil, etc) usually generates waste (solids, liquids or dust) of highly contaminating materials. It is, therefore, requested that work on maintenance and repairs is prohibited in these areas and that the Plan previews spaces where there may be guarantees for control of liquids, solids and aerosols, in such a way that that nearby surroundings are not affected (neither land nor sea) and that a controlled collection of such waste is made. Similarly, the necessity of defining specific moorings linked to slipways has been expressed. For this, the Plan cites different places (Es Grau, Cala Moli and Macaret, Sant Tomàs…) where action is expected in order to generate new parking for cars and trailers that complement the services expected at the slipways. But these areas are not detailed, there are only drawings for large expansions and which, it is assumed, will have to be settled. This lack of definition prevents adequate evaluation to see if any impacts generated are balanced by the services they wish to offer. As an example, the Es Grau area had a substantial increase in parking some years ago and it is incomprehensible that yet again they would want to increase this service. In addition, at Cala Molí and Macaret, limitations are found that are not easy to resolve.